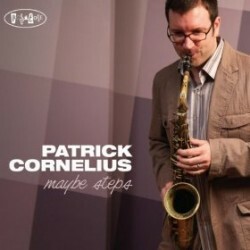 Saxophonist Patrick Cornelius’s latest CD is Maybe Steps (Posi-Tone, 2011). In this interview, Cornelius talks about the new record as a continuation of his previous full-band writing, after a break for his trio record; why it’s important to him to tell stories during his live performances; his time in the artist diploma program at Juilliard; and the economics of jazz records. Learn more at patrickcornelius.com and follow him on Twitter at @PCorneliusMusic. I love the way these tunes showcase PC’s relaxed, lyrical phrasing even over quirky rhythms and angular intervals. And I admire his ability to write such inventive, creative music yet still maintain a listenable “pop” sensibility. I haven’t had a chance to catch him in concert, so it was cool to learn a little about his on-stage persona and behind-the-scenes creative process. The Mark Free “manifesto” — that sounds interesting. I’d like to read it. Can you point me in the right direction? Thanks again for the excellent music and discussion. You coming to NYC any time soon?